Googong Dam lies to the south of Queanbeyan, NSW, and is a water supply dam for Canberra. Googong Dam is a minor ungated earth and rock fill dam with a clay core and a concrete chute spillway plus a nearby 13 metres (43 ft) high earth fill saddle embankment. It dams the Queanbeyan River upstream of Queanbeyan in New South Wales, Australia. The dam’s purpose is to provide a water supply for Canberra and Queanbeyan. The impounded reservoir is called the Googong Reservoir. Googong Dam was created through enabling legislation enacted via the passage of the Canberra Water Supply (Googong Dam) Act, 1974 (Cth). Completed in 1979, the Googong Dam is located approximately 5 kilometres (3.1 mi) south of the town of Queanbeyan on the lower reaches of the river. The dam was built by Thiess based on designs developed by the Commonwealth Department of Construction; and is now managed by ACTEW Water. The Engineer in Department of Works who designed the dam was Arne from Finland, whose surname I cannot remember. Because the town of Queanbeyan was downstream, the safety of the residents had to be considered. Flooding might breach the dam walls during construction and send a wall of water downstream. The first task was to construct a diversion tunnel for the river whilst the dam was constructed. This was uneventful, apart from the initial opening of the tunnel where the enthusiastic powder monkey used too much gelignite and blew rock debris 50 metres across the river. The site was cleared of all soil and debris with high pressure hoses. The Googong Dam was to be an earth and rock fill dam. Joints in the underlying rock allow water to seep through and have to be sealed with a slurry of bentonite and cement known as grout. A Curtain Grout establishes an impenetrable barrier along the centre line of a dam by pumping grout into deep holes. A Blanket Grout seals joints beneath the dam by pumping grout into shallow holes. The core must be bonded to clean rock with clay leaving no gaps whatsoever. Clay is then added and consolidated with rollers. If the bonding is slipshod then water will percolate through the foundation and the dam will fail. I was in Idaho in 1974 when the Bureau of Reclamation was building the Teton Dam. We were led over the site and saw the workmen setting clay on the rock and it was clear that they were not making a satisfactory bond between the clay and rock. As visitors we could not criticise but knew that the dam would fail which it did catastrophically in June 1975. In the USA, the Corps of Engineers were responsible for building concrete dams in mountainous areas, and the Bureau of Reclamation for constructing earth and rock fill dams on the plains. The Bureau of Reclamation ran out of sites for dams on the plains, and ventured into the foothills for the Teton Dam with disastrous result. The Department of Works decided that they would construct the lower portion of Googong dam as standard earth and rock fill up to the point where failure of the dam would not endanger the town of Queanbeyan. 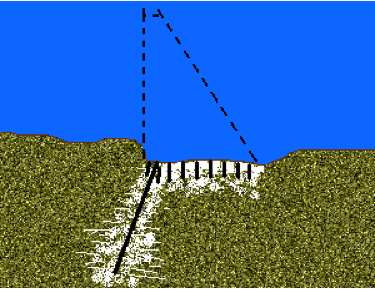 Construction above that level had to ensure that the dam could be overtopped but would not fail. This was achieved by anchoring the downstream rock fill with a network of steel mesh. Three days of torrential rain filled the reservoir and overtopped the dam during construction, and it did not fail. I remember sitting on the abutment with Arne and watching the water pouring over the top of the dam and gushing through the diversion tunnel. (see photo below). The dam was completed without problems and a spillway was constructed through an adjacent saddle. 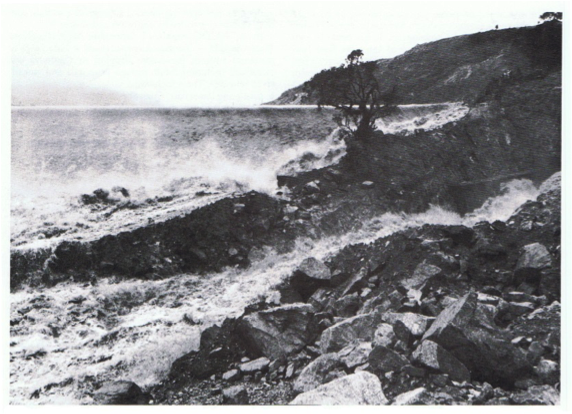 Successive flood events in 1978 and through the 1980s resulted in extensive erosion in the unlined section of the spillway chute. 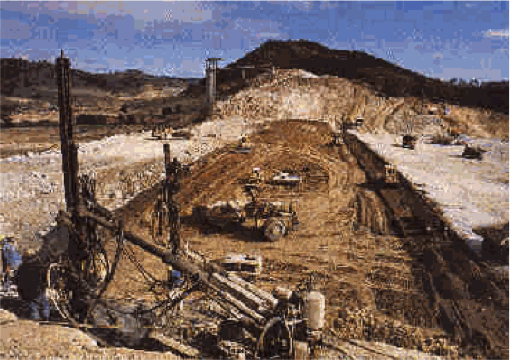 Staged remedial works were undertaken in the 1980s to protect the eroded structure, and increase in the capacity of the spillway, to meet extreme flood events. The dam wall height is 66 metres (217 ft) and is 417 metres (1,368 ft) long. 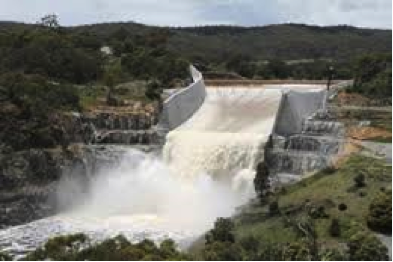 At 100% capacity the dam wall holds back 121,083 megalitres (4,276.0×106 cu ft) of water at 663 metres (2,175 ft) AHD. The surface area of Googong Reservoir is 696 hectares (1,720 acres) and the catchment area is 873 square kilometres (337 sq mi). The ungated concrete chute spillway is capable of discharging 10,500 cubic metres per second (370,000 cu ft/s). 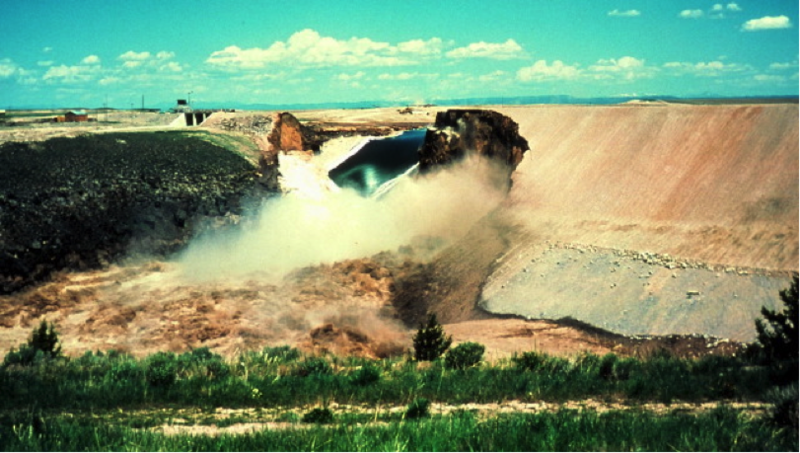 Successive flood events in 1978 and through the 1980s resulted in extensive erosion in the unlined section of the spillway chute, including a large erosion hole, up to 19 metres (62 ft) deep and 25 metres (82 ft) wide, in the upper part of the spillway chute. Staged remedial works were undertaken in the 1980s to protect the eroded structure. Remediation of spillway facilities occurred during from 2006 through to 2010 that resulted in an increase in the capacity of the spillway, construction of walls in the spillway chute extension up to 17 metres (56 ft) high, and a range of other enhancements to meet extreme flood events.